We can design and analyze RF sites for Cellular, PCS, AWS, and 700MHz wireless technologies. We also have the capabilities to validate existing propagation and capacity models, and assist in developing site design requirements and system project parameters. We provide a comprehensive study of the market, coverage area, coverage holes, and give recommendations to possible coverage problems. Using the latest in modeling software complemented by the precision of 10-meter nationwide data we produce extremely accurate plots and present them in any number of formats, from PDF to Google Earth. Our engineers have been in the business for decades, so you can be sure that each plot that they produce is accurate. At Wireless Applications Corp we have the experience and tools to efficiently plan frequency allocation. We strive to better your operational performance while minimizing investments and enhancing both network quality and capacity, either between neighbors or systems. We are fully capable of analyzing the radio frequency spectrum, identifying transmitters, and calculating interference in the market to provide actions to eliminate or reduce adjacent channel, co-channel, and inter modulation interference. 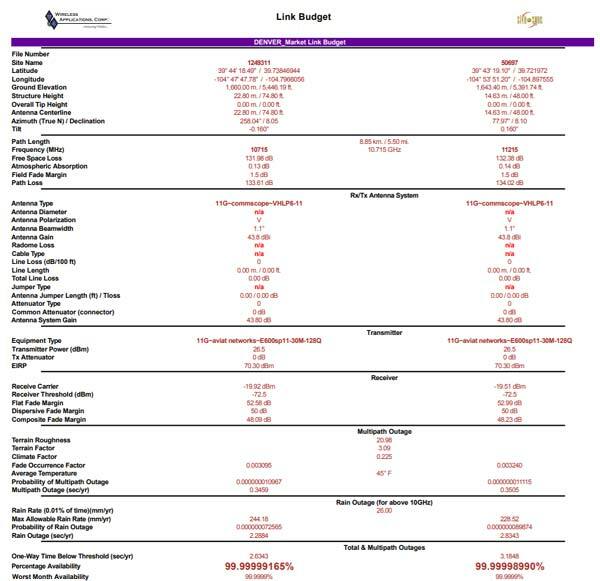 A link budget calculation is an excellent means to begin to understand the various complexities and factors involved in a communications link. We analyze detailed propagation loss computations and power budget predictions on both the transmitter and receiver side. The Link Budget computations describe the received signal level, total gains and losses, fade margins, power requirements, and balances the path between the base station and the mobile unit depending on distance from the base station. Our engineering team can help you deliver a high quality network system design based on marketing strategies, traffic projections, market penetration, calling pattern, busy hour, local terrain, etc. Depending on your needs, we can then issue search rings, communicate with construction management, and file associated regulatory documents including FAA, FCC registration, and FCC five year build out deadlines. Assisting companies through the planning stages, design, acquisition, FAA-FCC Filing, and site turn-up our engineers have access to a breadth of efficient tools for both project design and tracking. Our team would also have the ability to integrate the project into SiteSync making all progress secure yet available on the Internet.